A fashion head is basically an oval to which you attach a beautiful upper body. Start with the neck and add in shoulders to see your fashion figure start to come alive. Breaking figure drawings down into basic geometric shapes and using lines of proportion solves half of your problems in creating figure drawings. You use your lines of proportion to guide you. Keep in mind that not all drawings include the entire body; you can end your figure at the waist, especially if you’re focusing on upper body clothing. Draw an oval head shape. 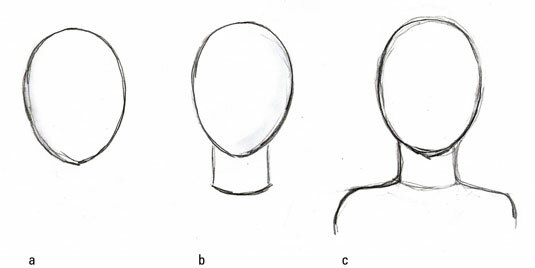 Draw the neck by starting on both sides of the chin area and creating a short cylinder-like shape about 1/3 head high. The shoulders, which are bigger for men than women, ease out of the neckline. They extend slightly beyond the head or about the length of 2 heads turned sideways, and they form the top of the arms. Having a real-life model helps tremendously when you’re doing figure drawings. Go to a figure drawing class and work from a model if you can. If you can’t get to a class, grab a friend who’s willing to sit still. The advantage of drawing from real life is being able to see all the real body parts and proportions. If you can’t rope anyone into posing, buy a wooden mannequin at an art supply store to help you with form and shape.